During this Frontier League season, Schaumburg Boomers outfielder Justin Vasquez noticed that something was wrong. He was fatigued and had a cough that just got worse as the season wore on. After many tests, Justin was diagnosed with Primary Mediastinal Large B-Cell Non-Hodgkin’s Lymphoma on August 26th and is currently undergoing chemotherapy. 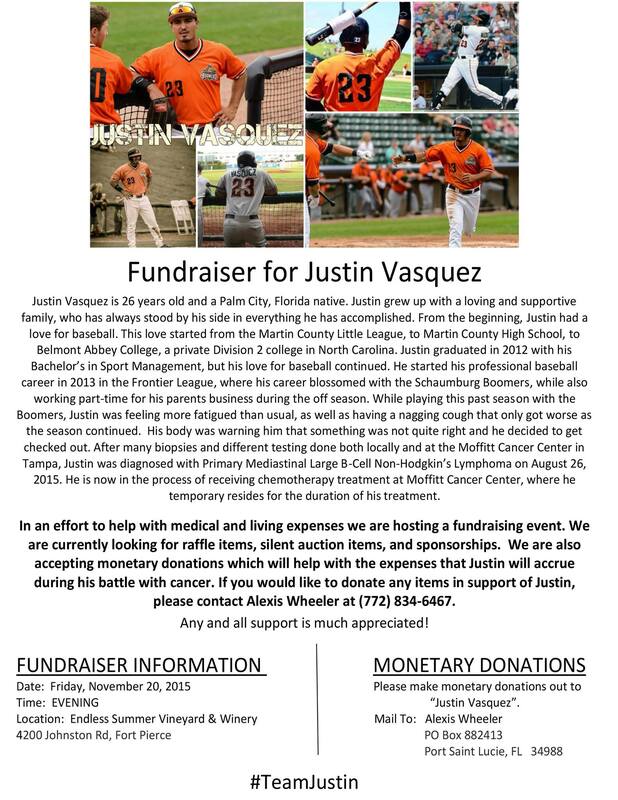 A fundraiser has been set up to help with medical and living expenses and will be held on November 20th in Fort Pierce, FL. Currently, they are accepting donations such as raffle items, silent auction items, sponsorship, and monetary donations for the event. A Facebook page has also been set up to support Justin through his fight, Team Justin. There have been many people asking for information regarding a fundraiser for Justin and we are currently in the process of setting one up. We currently have the location and date set. The date is set for November 20, 2015 at Endless Summer Winery in Fort Pierce, FL. This event will be a very nice Friday evening filled with fun, food, drinks, music, 50/50, many raffles, and some really great silent auction items! More details on the event to follow… but mark your calendars! Currently we are working on building our raffle and silent action item list so we have some more really great items! If you or someone you know would like to donate any items to this event please contact me. My contact information is listing in the flyer that is attached to this post. No item is too small or to large for this event. Please see the flyer for more information or please feel free to contact me with any questions or concerns. You are all such amazing people and we appreciate all the support you are giving Justin during his fight with cancer. We all know he is going to knock it out of the park!! Previous PostFrontier League Regular Season Wrap Up – Draft Class, Aussies and EvansvilleNext PostWhy Do Players Love Indy Ball?